I think one of the biggest misconceptions about the raw food lifestyle is that it’s too time consuming. I totally disagree. I think it might take a little bit of a learning curve to get into a new habit of making new recipes, but honestly, my meals take me about 5 minutes to make on average, and I find that cooking really requires more time, energy and effort! When people are transitioning to raw foods, they may make a lot of dehydrated recipes to mimic foods that were eaten on the SAD diet (Standard American Diet) but I live and promote a low fat raw vegan lifestyle, and not all raw food diets are the same. This means lots of fruit, smoothies, veggies and salads and so much more, but fruit and vegetables make up the base, with nuts and seeds a small part of the daily diet. Here’s a kiwi apple smoothie recipe you can make in under 5 minutes! There’s so many new smoothie recipes you can make, this lifestyle doesn’t get boring for a second! For this raw smoothie recipe, all you’ll need a high-powered blender. I personally use and recommend the Vitamix Blender. 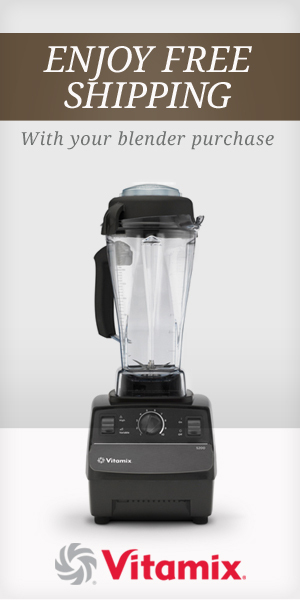 I wrote a comparison review on the Vitamix, comparing it to the Blentec, that you can read here. A high-powered blender is one of the top 4 raw food kitchen tools I recommend stocking your kitchen with. Blend together on high, serve, and enjoy! Kiwis are such interesting fruits. They have such a distinct taste profile, not to mention a distinct look! When picking kiwis, you want them to be just slightly soft to the touch. If they are still hard, allow them to ripen at room temperature until slightly soft and then place in the fridge to slow down ripening if you’re not ready to consume it. Hope you enjoy this Raw Kiwi Apple Smoothie! Laura Dawn, Author of Mindful Eating for Dummies and Unhooked: A Holistic Approach to Ending Your Struggle with Food.